Being a client centric firm, we deliver an impeccable range of Nephrology Products to our customers. The raw materials utilized in the manufacturing process are procured from the most reliable vendors of the industry. These products are also used for the treatment of kidneys and widely appreciated by customer all across the globe. They are in compliance with the medical standards manufactured under the surveillance of our expert professionals. Our clients can avail the product at very reasonable rates and within the specified time frame. Products come in different packagings according to the dosage requirements. * Dilator locked clockwise does not move backward and allows easy operation. * Close contact between the tip of sheath and dilator developed through our long term of studies and experience allows safe and smooth insertion into vessel. 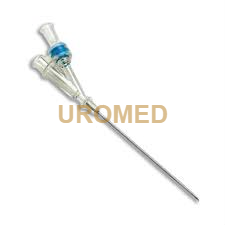 *This Needle is manufactured by one piece molding process developed by us ensures easy guide wire insertion. sheath with 3 way stopcock, 5ml syringe, Introducer needle, Guide wire with helper, Dilator, injection cap, Scalpel. Central Venous Catheter Set has intra Venoseld catheters which are made of micro smooth and anti thrombogen biocompatible polyurethane. 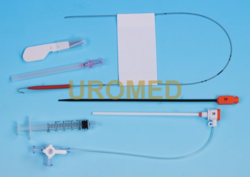 All catheters consists of high flexible thin walled polyurethane which ensures very high flow rates. The extremely smooth catheter surface prevents deposit of thrombi.The soft tip minimizes the danger of vein perforation. Likewise, incompatible drugs or solutions can be infused separately in a quick and safe way. 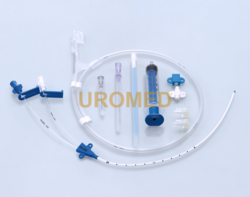 Hemodialysis Catheter provide temporary vascular access for hemodialysis until a permanent access is available or until another type of dialysis therapy is substituted. 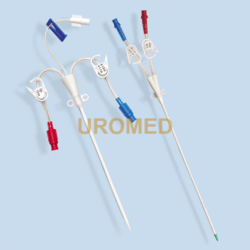 The multiple lumen catheters contain two large bore lumen that are connected to the dialysis machine to form a complete circuit for the removal and return of the patient‘s blood during treatment. The intra-catheters are intended for percutaneous introduction using the Seldinger Technique. The catheter can be changed using the existing puncture. Thermosensitive, softens as it warms to body temperature. Smooth inside and outside surface, avoid clot formation. Radiopaque, facilitates quick visualization under X-Ray. These needles are utilized for infusing glucose or taking out blood from veins. The Y Shape obtuse needle valve of these needles forestalls blood misfortune and aides in controlling the stream of liquid. The sharp needlepoint helps in simple cut and its smooth divider brings down the resistance of propelling the aide wire. The offered scope of Y Shape Introducer Needle is made with the best quality hygienic material and guarantees complete wellbeing of the patient and also the clinician. Transparent hub housing designed to allow visualization of flashback. The needle point is very sharp and can make easy puncher. 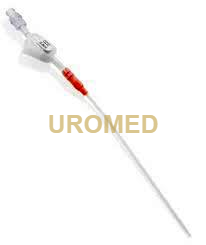 For the Nephrology Section, UROMED offers Guide wire with and without PTFE coating. This wire is made by Galvanized Stainless Steel, and having fixed core. 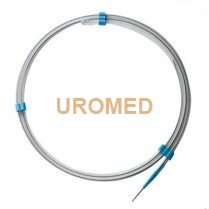 UROMED guide wire has excellent flexibility. Better push ability for increased placement control. Low of coefficient of friction for smooth advancement. Looking for Nephrology Products ?